Many runners applauded the lightweight construction of the Vibram FiveFingers V-Run. This shoe is highly breathable as mentioned in some reviews. The V-Run is available in different color options. It gives an impressive fit. This shoe is reliable when used on extremely cold conditions. The sole wears out quickly based on some reviews. This shoe is slightly expensive. The Vibram FiveFingers V-Run provides a combination of support, durability and better ground contact. Several users admired the shoe's performance on the road, and despite being slightly expensive, a lot still recommend the shoe. The V-Run is equipped with the necessary technologies to surely perform well even on extremely low temperatures. 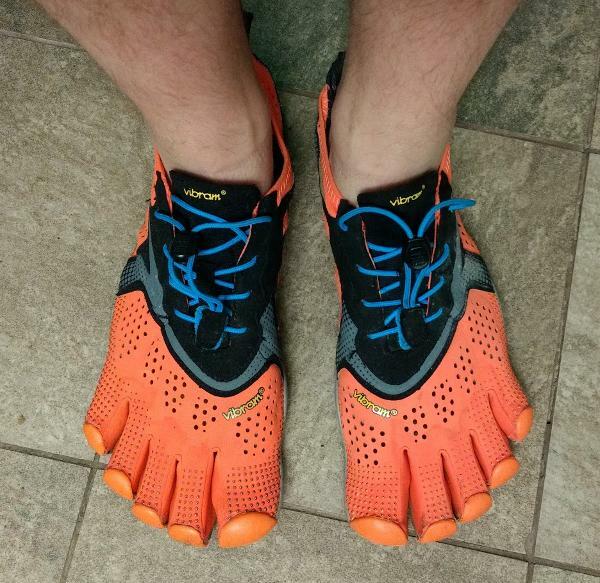 If you’ve never tried a pair of Vibram Five Fingers before the V-Run is the style to try. Vibram has really nailed the upper on this one, and you barely notice the tops when they are on your feet. Now, these are as minimal as minimalist can get so I’ll sprinkle in words of caution based on my own experience through the rest of the interview. Fits like a glove is an understatement for this shoe of course. It is quite literally a glove for your feet, with an almost stealthy goodness once you find the right size for your foot - which can vary depending on the shape of your feet. Be ready to try on a range of sizes to avoid dealing with painful pinch points. I’ve been acclimating to these shoes for about six months now and the only problem I’ve found is my mechanics don’t seem to keep up with my desire to run in these shoes. Be careful as they’re really, really fun to run in, especially if you enjoyed running around barefoot as a kid. It’s a love-hate relationship but I’m in it for the long run and taking my time. Uppers are a synthetic mesh that stretches efficiently and keeps your feet feeling fresh mile after mile. Protection is nearly non-existent so remember the tops of your feet are essentially barefoot. The lacing system is different and takes a bit of getting used to, but the construction seems solid and able to last. Like the Merrell Trail Glove 4, the insole is stitched to the outsole, which provides incredible comfort. However, it seems to be lacking the extra bit of compression molded EVA that you can find in other models. Check out the Vivobarefoot Primus or New Balance Minimus as alternatives to find what feels right for your foot and realize that it might take some time to find the right fit (or your foot to adapt). The Vibram outsole is the hallmark of this shoe (and the brand in general) and the Vibram Run, XS Run, and Mont compounds are placed in strategic areas that provide unparalleled grip on a wide range of surfaces. Very little wear and tear are present after wearing them daily. I’ve put in over 100 miles running and see the sole lasting until at least 1000. If you are a barefoot aficionado looking for a little armor for your outdoor activities look no further. For the definition of a minimalist experience look no further than the Vibram Fivefingers V-Run. The responsiveness and grip of the sole paired with the individual movement of each toe mean you have complete control of your foot. Your arch is slightly exposed on the side but if you’re doing serious trail running just pick up a pair of the V-Trails. I can’t end this review without recommending to listen to your body when making the move to these shoes. Your brain will take a bit to process the change in gait needed with all the dynamics in play. Once the switch flips, though, just be sure to only increase your mileage in very small increments. Do not think you have to comply with the schedule Vibram suggests or suggestions from friends. Just take it slow and have fun. I started running a few years ago. Coincidentally, that was when the Vibram Fivefingers started as well. Unlike many others, especially women, I found their “design” captivating and I liked them. That is when I purchased my first pair of VFFs. Here I am, many years and even more kilometers later doing a review of their model V-Run. Before I bought V-Runs, I was searching quite a lot for a possible replacement for my older VFF KSO EVO (which I use for fitness now). After a long time reading on forums and searching on the Internet, I decided to stick with the brand I was familiar with. I wanted minimalist shoes that would last me for as long as possible and carry me through my volume training. If you are familiar with Vibram Fivefingers, you can skip this paragraph. For all the other, as you can see, Vibram Fivefingers are minimalist shoes with the uncommon design. Each toe has its own socket, which together with a thin sole allows for greater mobility and better ground perception. Running in Vibrams is different compared to “typical” running shoes with stacked outsole and midsole. These shoes are not intended for everybody and getting used to running “barefoot” style takes time. Materials used in V-Run are different from those used in the previous models. The upper of the shoe is from a soft, perforated polyester lycra stretch mesh and polyester microfiber. The material must be the softest I have ever touched! It is thin enough, and perforation makes it easy for water to evaporate during hot summer days. While they seem to be intended for hot days and summer runs, I have been using them all year round, and I was surprised the first time I took them out in below zero degrees (Celsius) because my feet were not getting colder. My hypothesis is that it is because your toes and feet work and move in VFFs compared to traditional shoes, which promotes better blood flow. The upper also stretches quite a bit, and I can say that out of all the pairs I own, these are the fastest to put on. The outsole of the V-Run is molded into the midsole. The midsole is the yellowish compound in the picture, and the outsole is created by the black (Vibram MONT®) and blue (Vibram® XS RUN) areas. These are the impact zones that require more protection and grip used during a run. What Vibram achieved by this is weight reduction of the shoe, which is only 136g (4.8 oz.)!!! I have run in these shoes on different terrains - from paved roads, tarmac and some easy trails, wet, dry, covered in ice and snow. The shoes are quite grippy. I was especially surprised on icy roads. No, you cannot compare it to having shoes with metal spikes, but they held their ground during slower paces. These shoes have been designed for roads, and that is where they excel! You can take them to easy trails without hesitation, however, beware of pointy rocks, which you will feel and they can even cause you pain as the thin sole doesn’t offer much protection. I feel the need to talk a bit about cushioning here as well. While these are minimalist shoes with only 4mm EVA and Vi lit midsole, they feel very cushioned compared to some other models, namely KSO and KSO EVO. You might appreciate it if you want to transition from traditional shoes or when you run a lot and log many kilometers in these shoes. I never felt discomfort during paced runs nor longer runs. Durability has been a big deal for me, especially since I started training and logging 50+ miles (80+km) weeks. The deal is that no matter how durable, the 2.5mm outsole will wear faster than the ones with 1- 2 cm thick sole. Therefore, you can expect them to replace a bit sooner than your traditional shoes. Here you can see a close-up of the wear after about 600km (372 mi). As you can see, the rubber on the big toe is worn off more than on other toes, which is to be expected. On the other hand, I am confident to get at least one time the distance I’ve run so far. The material, both upper and outsole/midsole seem to be quite durable (more than the materials on used on KSO EVO), and I expect them to last about 1,500km (932 mi), which is O.K. in my book. (KSO EVOs lasted me about 600 km before I had to retire them from running, still usable, however). Regarding the durability of the upper, I have never experienced stitches coming undone or sole getting unglued on any of my pairs. What I have experienced are tears on my big toe (right foot only), however no with this pair - that issue seems to be trail running related. Also, I have not experienced any rubbing of my feet and consider these shoes to be super comfortable due to the stretchy material and comfortable midsole. The fit of this model runs true to the size. As I mentioned earlier, V-Runs have the most stretchy upper, and I can get them on the fastest of all the models I have tried. Contrary to some other people’s experience, I have not experienced any problems with the fit such as shoes getting more stretchy or shoe being too loose in the heel area. For me, the fit is perfect. My toes have just enough room. I only felt they were a little bit lose than needed when I sprinted in them, but I guess it also mattered of getting them tighter for sprint workouts contrary to wearing them more on the loose side like I prefer to. Having said that, during the run I often forget that I even wear shoes, which is an amazing experience! 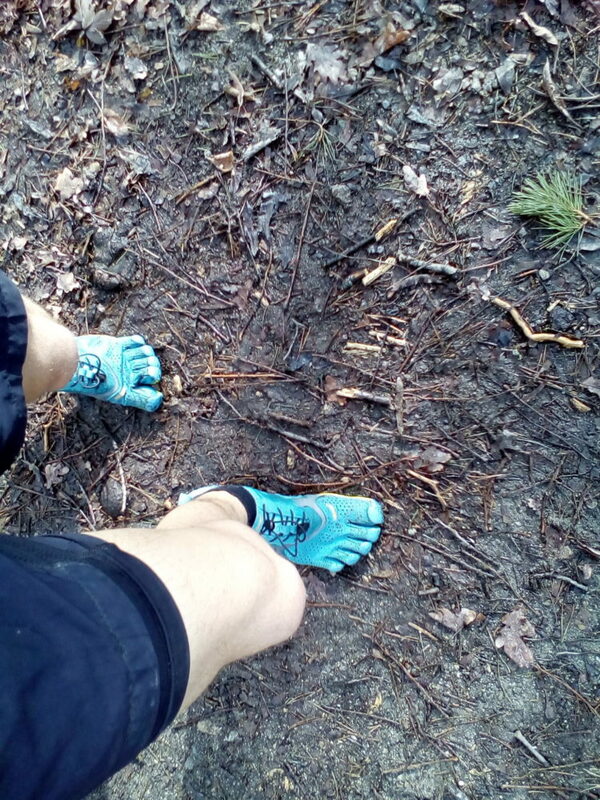 The Vibram Fivefingers V-Run is an excellent addition to VFF series, especially good for daily training and high volume running on paved roads. They provide excellent breathability while being usable all year round if the winter is neither too cold and wet. I recommend these shoes for any minimalist runner or people who want to transition into minimalist running. The price of these shoes was what made me give its overall score. I bought them for 140€, which is pretty pricey. You can get shoes that are cheaper per mile when it comes to their life value, however, the more minimal the shoe is the lesser life expectancy it has. I can clearly see that Vibram is improving the shoe design from model to model and every time they get better and better, which I am happy to see. There is always some small improvement in grip, stitching, breathability and small things that make a big difference. These things are just great! The only major difference is that the V-Run has a more durable outsole, and the midsole has slightly more padding. The Vibram FiveFingers V-Run features the Vibram Vi-Lite technology that is designed to deliver a lightweight yet responsive cushioning. It absorbs shock during landing and releases energy efficiently for a solid rebound. This Vibram FiveFingers running shoe also features the brand’s XS RUN outsole compound that delivers maximum stable hardness on different surfaces. It also enhances ground contact for an improved running experience and it delivers an impressive grip on soft surfaces. It also features the Vibram Mont compound that is formulated to trekking, mountaineering and motorbike racing. It delivers highest reliability while running on different terrain at relatively low temperatures. When it comes to the sizing, the Vibram FiveFingers runs large. You need to purchase one size smaller than the actual running size. It has snug fit in the heel and midfoot. For an improve fitting, the shoe has a single-pull lace for the footwear closure. The outsole of Vibram FiveFingers V-Run is made up of Vibram Run rubber. It also has Xs Run technology that delivers impressive grip on varied surfaces. It is also designed to deliver improved ground contact. The midsole of Vibram FiveFingers V-Run is made of EVA material for excellent cushioning and durability. The Vi-Lite midsole technology delivers a lightweight cushioning. It absorbs shock efficiently and maximum energy release for a more powerful toe-off. The upper of the Vibram FiveFingers V-Run is made up of Polyester Lycra Stretch Mesh + Polyester Microfiber. It provides maximum breathability. It keeps foot well-ventilated, keeping it cool and dry all throughout the run.